I hate to write this because it was mildly traumatic, but if I could ever figure out how to get this blog to come up in search engines more than my handful of friends may come across it, which I would like because 1.) I’d love for people dealing with similar situations – i.e. a suddenly disabled dog – to read Alec’s story (from the beginning when things were so scary, to know things can get a lot better) and know there is hope, and 2.) I hope people who walk around with their dog off-leash may see this and possibly reconsider that choice! First of all, Ali is fine (however, because I need to protect his back for the rest of his life, “fine” may not always be something I can see, if you know what I mean. Any damage done internally after a scuffle will not be immediately obvious). Here’s what happened: I took Ali outside for his morning pee in his Walkabout Harness. I had just woken up and had not even had coffee yet. We were in my front yard and had just descended the little hill onto the sidewalk in front of my apartment and got ready to turn the corner (where there is more grass) when I saw a woman walking with a black lab mix who was off-leash. Now, in the past I admit I have had a tendency to almost panic in these situations (but who could fault me for being a little overprotective of Ali after his multiple surgeries? Still, I know it’s time to stop “babying” him and let go of some of that fear) but recently I have been practicing projecting a calm, assertive energy while on walks and in public, which has actually been very effective, thank you Cesar Milan, aka Dog Whisperer. The thing is, this all happened REALLY fast. So the dog sees us, he was only a few car lengths away, pretty close, and immediately bolts toward us. I tried to be calm “Call your dog.” …but the dog keeps coming… “Call your dog!” …and not looking friendly at all…”CALL YOUR DOG!” and then the dog was upon us growling and snarling and trying to get at Ali (who at this point in growling and trying to lunge as well – who can blame him?!) and that’s when my calm assertive energy went out the window. I tried really hard to put myself between Ali and the lunging dog, but if you can picture the Walkabout harness (it is like a pair of pants over his hind legs with handles on top so I can support his back end), I am holding Ali’s hindquarters up by the handles of the harness so am in a very bad position to defend him. My hands are basically tied – one on his leash, the other on his rear harness, all the while trying to keep the other dog away while making sure Ali stays on his feet. God, it was awful! And the dog was not friendly at all; as soon as he reached us he bared his teeth and started snarling and snapping, trying to bite Ali from different angles, lunging like a snake, as I pivoted to keep myself between them. It all happened so fast but it seemed like an eternity before the owner finally got there and pulled the dog off. What was she doing this whole time? Yelling, “Bear! Bear!” to absolutely no avail. The dog did not even glance toward her one time after he saw us and bolted. I have gone over it in my mind and am still not sure how I should have reacted. This type of thing has happened before (although this was one of the top scariest “incidents” because he was in his harness and way more vulnerable than when he is in the cart…and even in his cart he is pretty dang vulnerable considering how easily it can tip over), so I now carry pepper spray when we walk. However, there was no time for the pepper spray, if I even had it on me (I think I actually had left it inside because we were just going out in the yard). Again, we were right in front of my apartment, not even on a walk. So I used my voice to try to scare the dog off, but he did not even hear me. Once they get into that frenzied state, it is pretty much too late. If this were a normal situation, i.e. one where my hands were free and Ali was not wearing a harness, I would have made sure to get between the dogs and I really think this would have been possible because Ali has actually gotten a lot better about this since I have been working with him on our walks to ignore other dogs. The complicating factor was the harness. I feared if I dropped it, Ali would fall over. He is doing great but in a situation like a dog fight, his body is going to contort in ways in should not. So I was not letting go! But that left me with no hands and no leverage. So, the whole thing was basically scary and sucked and then I had to worry that my position as pack leader in Ali’s eyes would be compromised, meaning he will want to take similar situations into his own paws again, and I would not blame him, because dog psychology says your pack leader should defend you and if not, well then you need to step up and take the job. The dog psychology stuff is another discussion, and Ali was not actually bitten by this dog (thank goodness!! ), and as Cesar says (I have become quite the Dog Whisperer devotee of late; I think he is awesome), you can’t live in the past but must keep moving forward so I was very conscious not to take that fear with me on out next walk and future outings in our front yard…because Ali will feel my nervous energy, which will only feed his defensiveness around other dogs. So it goes. The denouement: the woman finally got “Bear” back on his leash and apologized saying “he has never done anything like that before.” – and P.S. this is exactly why you should never have your dog off-leash unless you are in a designated off-leash area (most cities have plenty of these off-leash parks, and that is the place for your experiment, not my street! ), because the truth is you simply don’t know how your dog is going to react in all situations – I have seen it over and over and over – unless your dog is under your complete control in public. I have noticed most people erroneously think their dog is under control, until their dog sees something more attractive than staying by their side and bolts away from them, sometimes into the street. It only takes one “mistake” for a dog to get hit by a car and killed. I have seen that happen too. Regarding people misjudging their dog’s temperament, I saw this time and again when I took Ali in his cart to the park in Petaluma. 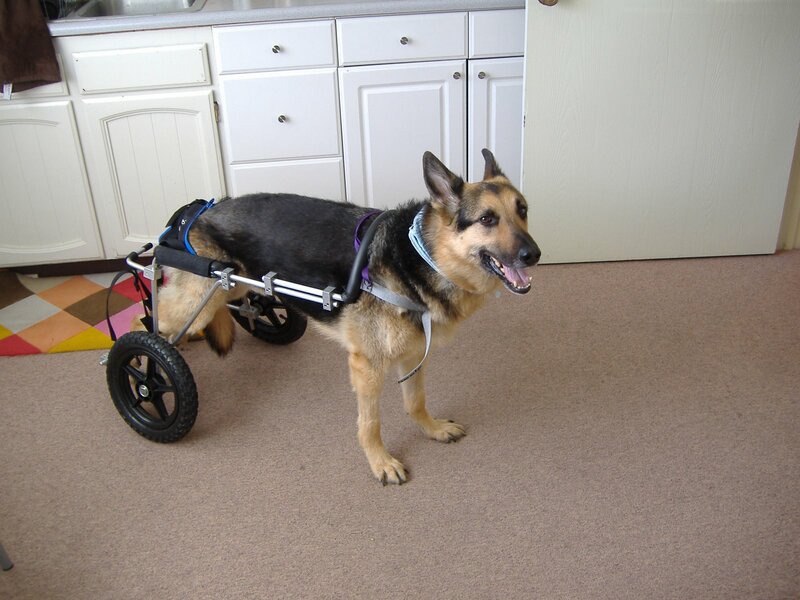 People said their dogs were friendly (which they probably were in most situations) so I let them approach, then they saw Ali’s wheels and tried to attack him because they had a reaction (which of course their owners could not predict) to the strange object – his wheels. Enough times of this and I bought pepper spray and began avoiding other dogs in earnest. 1.) Your dog may not be as friendly as you think. Ali and I have gotten run up on by clearly aggressive dogs so many times while their lackadaisical owner yells inconsequentially in the background, “He’s friendly! He’s friendly!” Newsflash: No, he’s not! 2.) Even if s/he is friendly, charging up to another dog (especially one who is on leash) is considered extremely rude in the dog world and will be taken as a challenge by all but the most submissive dogs. In other words, your “friendly” dog can easily trigger a fight with his/her incorrectly socialized behavior. I would be highly alarmed if a stranger of the human kind– no matter how “friendly” they may be – started running toward me while I was walking down the street and then proceeded to grossly invade my personal space. Your strange dog running up to us is no less alarming. 3.) Okay, let’s assume your dog is the friendliest, most mellow fellow in all situations, no exceptions. It actually doesn’t matter because my dog may not be! And that’s okay. Most modern domesticated dogs have one or several behavioral issues, either from irresponsible breeding, an unbalanced upbringing, ongoing unintentional reinforcement of unwanted behaviors by well-meaning but imperfect owners, a history of abuse and/or neglect…and the list goes on and on. There are many reasons why dogs living in human society are often unbalanced. This goes especially for those of us who adopt and rescue dogs with unknown histories, or known troubled histories. But those dogs deserve a chance too, and they have every right to be out enjoying a walk IF – and this is a big, important “if” – their guardian has them under control. Everyone has the right to be out in public without being accosted by a loose dog. 4.) Finally – and to me most importantly – my dog may be recovering from a back injury. Let’s forget for the moment the fact that our dogs may get into a scuffle. Ali is not even allowed to play with other dogs now; it is one of the most risky activities for his back especially since he tends to play rambunctiously. There is no way I can explain this to you in the three seconds it takes your dog to run up to us so please, please please… keep your dog on a leash? Thank you! 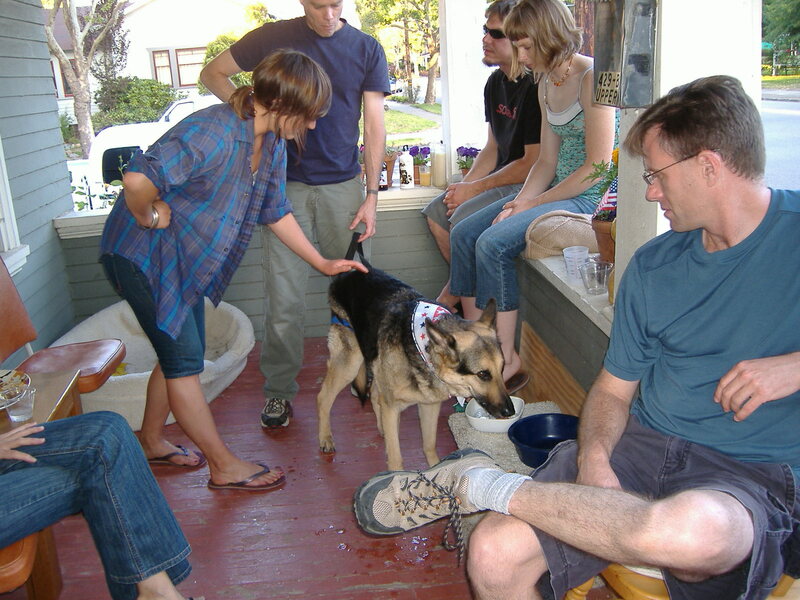 Maggie and I had a party at our house last weekend – a vegan potluck BBQ in honor of July 4th and our belated housewarming – and Ali had an absolute blast. Unlike many dogs, he is completely unperturbed by fireworks or crowds of strangers tromping through his house…in fact he seems to thrive on it (the large groups of people in his house, not the fireworks). This is rather strange, given his generally higher-than-average level of anxiety, protective tendencies, and oddball neuroses about things like moving water. But there you go – all dogs are individuals with their own inexplicable little quirks! I correctly anticipated that once people started arriving I would be functioning as Ali’s virtual caboose all night, grabbing his shepherd handles to lift his back end and ferrying him from room to room so he could greet, investigate and socialize with people at his whim. But my watchful friends were able to help with this task, so I did actually get a chance to relax and enjoy a cold beer or six. Ali was so tired by the night’s end he could not keep his eyes open. I rarely see him this tired – even swim therapy doesn’t knock him out like a good night of intense social interaction. I may have to throw parties more often…anything for Ali! The one I am most looking forward to is the one where he can walk up to his friends and greet them on his own. Dare to dream! …this is an important part of Ali’s physical therapy: weight bearing. At least twice a day we come to the park and I have him “stay” for ten minutes in a standing position so that he can put weight on his back legs. This type of exercise is important to counteract the effects of atrophy, which are already quite pronounced (his right hind leg, the weaker, is more atrophied than his left). If and when his motor function returns, it is important that he be strong enough to hold his own weight – otherwise we will have a situation where he can move his legs but is not strong enough to do really anything with them (stand up, walk). I also do “sit-to-stand” exercises with him a few times a day, which are pretty much as they sound. I start with him in a standing position and ask him to “sit” back onto my knee. Lots of praise! Then, with me supporting his hind end, I encourage him to push off and stand up. 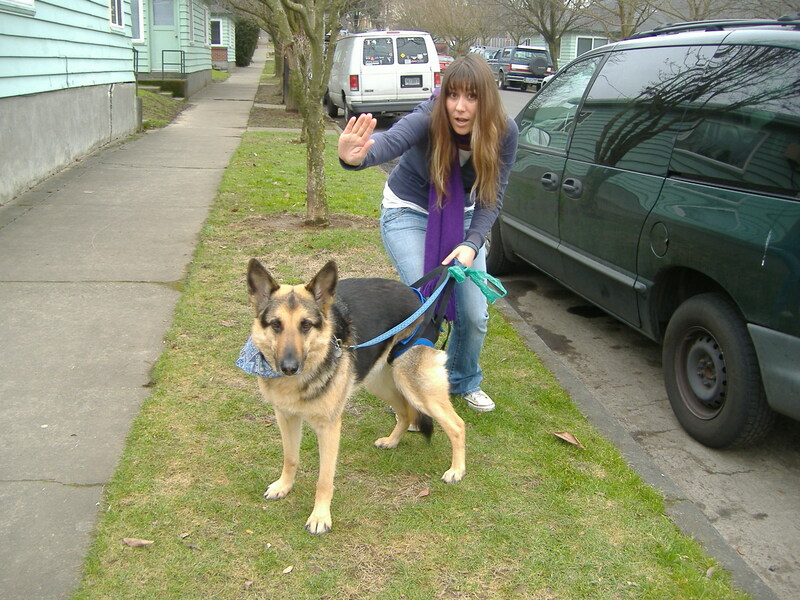 We repeat this a few times…as many as a wiggly, restless German shepherd can tolerate! This is good for strength and reawakening muscle memory. So, in terms of Ali’s ongoing physical therapy, it is important to have him bear weight on a regular basis. It can be challenging; ten minutes seems like nothing but it can feel like an eternity to both of us while we are just standing there. I try to distract him with sticks and cookies to make the time go by quickly. It’s hard of course because he is a dog and standing still is not exactly a natural posture at the park! He is such a good boy, though. I can only imagine how much more difficult this exercise that looks like “nothing” would be with some other dogs who are less inclined to want to please their guardians (my late great husky, Kobi, immediately comes to mind!). It is also challenging because people just love to walk right up to us in the park, with their dogs no less, even when we are hiding behind a rosebush trying to be inconspicuous. Of course no dog – no matter how well-behaved – can stay still in these circumstances so I have to politely tell them we are doing physical therapy and cannot talk at the moment, and sorry, but no, he cannot meet your dog right now. Ali’s wheelchair is an oddity and I knew he would draw attention but I am patently shocked at how many people flat out stare at us, turn their vehicles around in the street, and just approach us constantly with questions and comments, some innocuous and polite, others just plain annoying and nosy. Some dogs have reacted badly to Ali’s wheelchair and so I am much more cautious about him meeting other dogs in the park. In fact, I pretty much avoid it now. But I can’t take any chances. My neighbor’s dog recently tried to start a fight with Ali after they came up to us in the park and she assured me her dog was friendly. As soon as they sniffed noses her dog went for Ali and I had to pull him away from her – trying to make sure his wheelchair did not tip over in the process! Immediately she apologized and said she realized too late that her dog might react badly to Ali’s wheels as she barks at strange objects…including people in wheelchairs (!). Um, I wish you had thought of that beforehand! Anyway, Ali was alright but it has made me even more cautious than I already was, which is why it is a constant challenge dealing with people walking right up to us with their dogs, without even asking if it is okay first. Even when I turn around and walk in the other direction they sometimes follow us! And this is not an off-leash dog park I should add, lest I sound overly harsh. 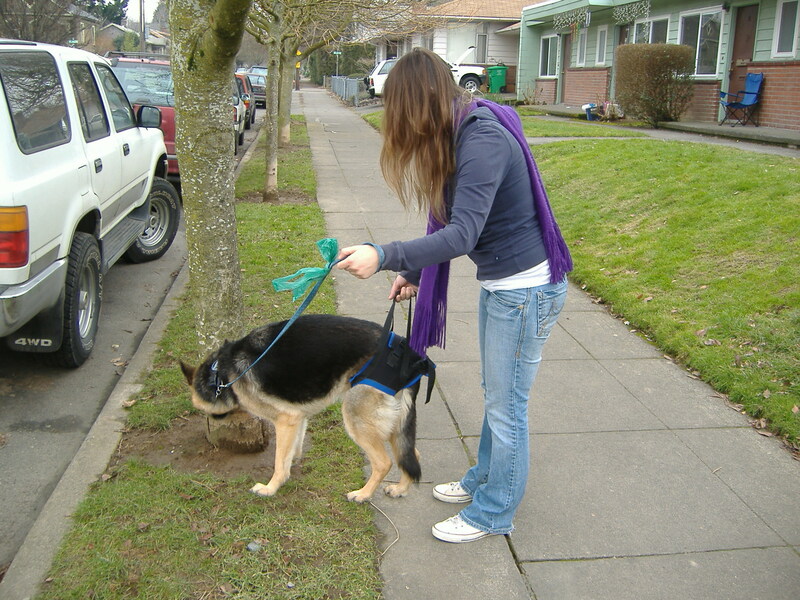 There are signs posted that your dog must be on a leash. It is a de facto dog park however and I really don’t care if people violate the leash law, as long as their dogs are under control, which unfortunately usually they are not! Nothing new – careless dog owners abound in general – but the stakes are higher for sure now that Ali is disabled. Moving out of the ALDF office tomorrow! It has been nine weeks since Ali’s second surgery, which means we have been crashing at ALDF headquarters for two months (if you just tuned in, we are living in my office because my former apartment in San Francisco has stairs and we needed to be on the ground floor for Ali’s recovery). Strangely, living in my office has actually become comfortable. It just goes to show how adaptable we are, I guess! Ali has adjusted amazingly well to not having use of his back legs and I have adjusted to living at work in a hybrid office/dorm room the size of a shoebox. The thing is, at this point, living here is a known quantity, whereas my new place has all manner of exigencies and contingencies. There is a whole new routine we will have to create and then there is that ramp…I will have to saddle him up in his cart (a routine in itself to which we are both still adjusting) and use the ramp every single time we need to leave the house. No more sling-walking him outside to go to the bathroom (my back finally stopped hurting, so that actually became easier). I will have to start loading him in and out of the van (with another ramp) to go to work, and in and out of his cart every time we get in and out of the van. 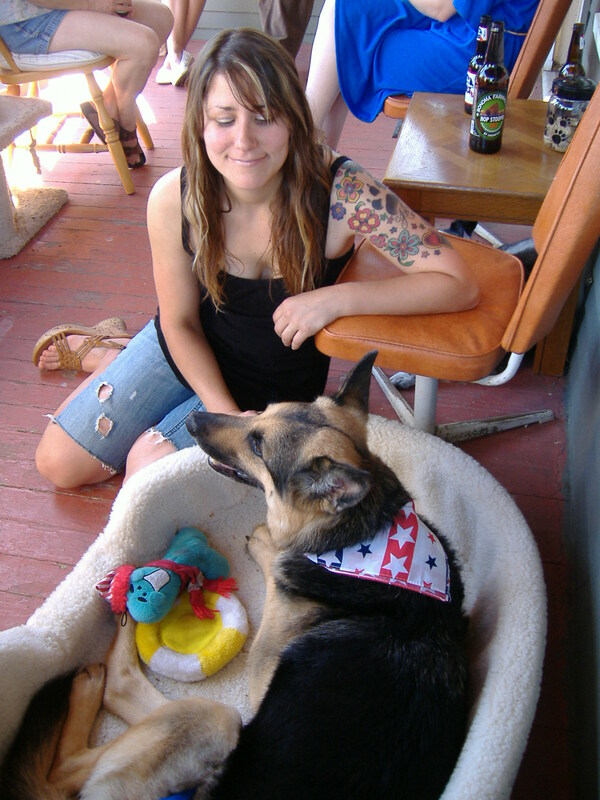 Then there is Seniorita (Rita, for short), my new roommate’s dog, whom Alec has not even met yet. This will be interesting! I am trying not to completely freak out, but moving is always and inherently stressful. 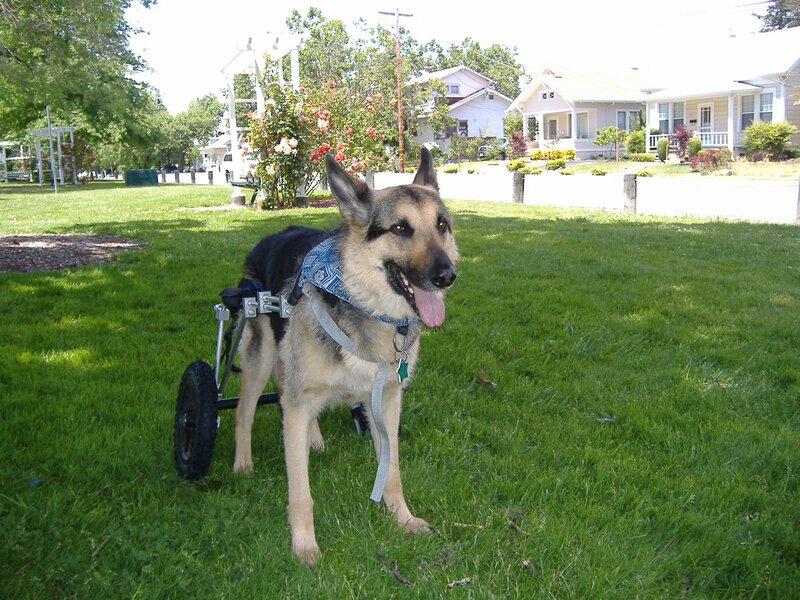 Throw in a paraplegic German shepherd with a brand new wheelchair and a new canine roommate and I imagine things can get real interesting real fast. There is also a park right across the street that appears to be a de facto off-leash dog park. It will be nice to have a big grassy area in such close proximity for Ali, but I am not sure how he will be about meeting other dogs in his wheels. He is usually fine at dog parks (as long as he is off leash), but I also need to be concerned with him not moving too much, so I’m not quite sure how this is going to be. My new neighbors also have two dogs who are outside a lot, so…lots of unknown factors, which are making me oddly reluctant to leave my cozy known quantity of an office/dorm room. We have a nice routine here that is working. But it is time to go. I can see how people become shut-ins, though, sort of. I am taking the day off tomorrow to make the move just so I can take my time with Ali and all this newness. Tonight though, I am going to pour myself a glass of wine and stop worrying. Because I have been kvetching about Eddie’s Wheels all day and I am tired of it, just a quick update about Ali’s inability to urinate in the cart. Juli, the fabulous and amazing canine rehabilitation specialist, came by today and rigged a soft saddle on the part of the cart that was pinching his urethra. It seems to be working part of the time. I will know more soon. But it’s nice to know she is willing to help us. I don’t know what we’d do without her! Oh, and she let me know I am not the only person who has had problems with Leslie from Eddie’s Wheels. Apparently, another physical therapist she knows refuses to work with her because of her attitude. But she also told me that Eddie’s Wheels carts are the best on the market and far superior to other brands, in her opinion. So hopefully we can make this work for Ali. But if anyone stumbles on this who is considering a cart for your dog, beware the urethra-pinching saddle if you have a male dog! They won’t tell you about it beforehand but it can be a serious problem. I am afraid Ali may have developed another urinary tract infection from not being able to properly urinate those first couple days in the cart. So this is a serious flaw for which they should take responsibility and be compelled, from a purely ethical standpoint (unbridled capitalism not withstanding), to start disclosing. This not a chair or an ipod they are manufacturing; it is a wheelchair – a ticket to mobility, freedom, and life – for a living being whom somebody loves very, very, very, very, very much. Photo: Ali in the ALDF kitchen today, before his mid-day stroll.